If you鈥檙e like me, you have dreams of delicious holiday breakfasts, leisurely eaten while wearing cozy sheep鈥檚 wool slippers and gazing out the window at the snow gently falling outside. I want that, but I also want easy 鈥� and I need gluten-free. I celebrate the holidays with my family, and some folks in our gang cannot have gluten. 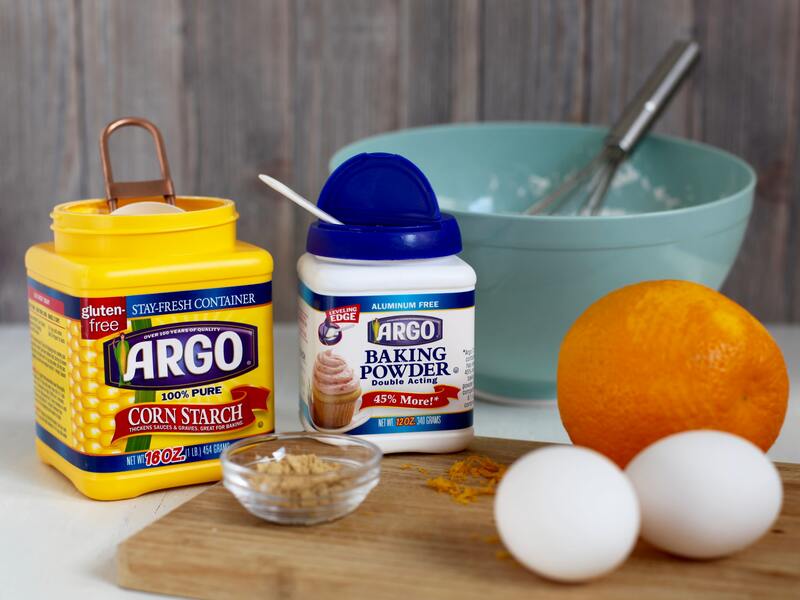 My quick fix for the festive season 鈥� and any time we all get together during the year 鈥� is to use a pancake recipe that uses Argo庐 Corn Starch in place of flour, like this supremely versatile GF buttermilk pancake recipe, and then spruce it up with winter flavors. The pancakes have the same delicious taste and texture as my traditional recipe, so everyone comes back for more. 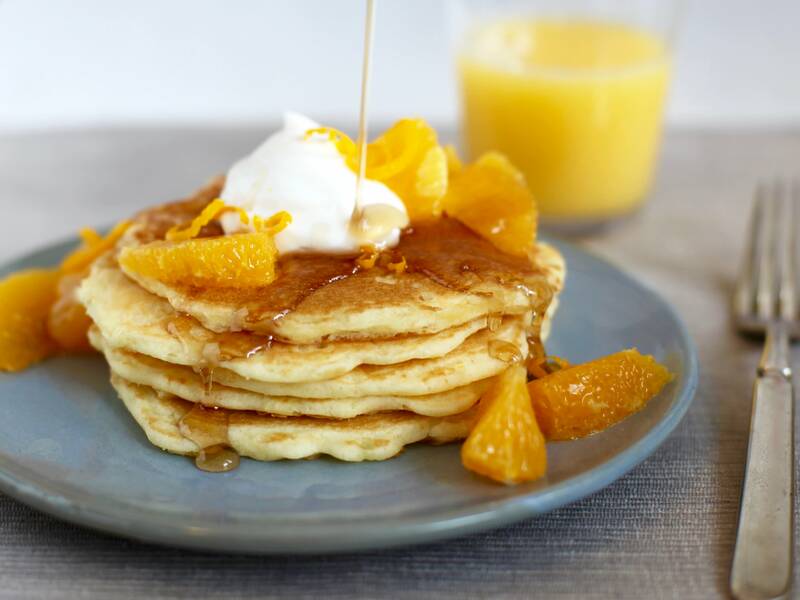 These gluten-free orange-ginger pancakes get a double punch of orange with zest and fresh fruit segments. With a hint of ginger and a dollop of creamy yogurt, this breakfast treat feels fancy yet is still simple enough to whip up in the midst of holiday mayhem 鈥� or on any Saturday this winter. Post and recipe by Tara Teaspoon. Place the corn starch, sugar, baking powder, salt, eggs, buttermilk, melted butter, and vanilla in a large bowl and whisk to combine. Let sit for 10 minutes. Meanwhile, finely grate the zest of one orange to get 1 tablespoon of zest. Peel both oranges and cut the segments out of the oranges; set aside in a bowl. Add the orange zest and ginger to the pancake batter and whisk to combine; the batter will be thin. Heat a large electric griddle or a few nonstick skillets over medium heat. Working in batches, drop 2 to 3 tablespoons of the batter onto the griddle or the skillet for each pancake, spacing each pancake at least an inch from the next. Cook until golden-brown on the bottom, 1 to 2 minutes. Flip and cook until the second side is golden-bown, about 1 minute more. 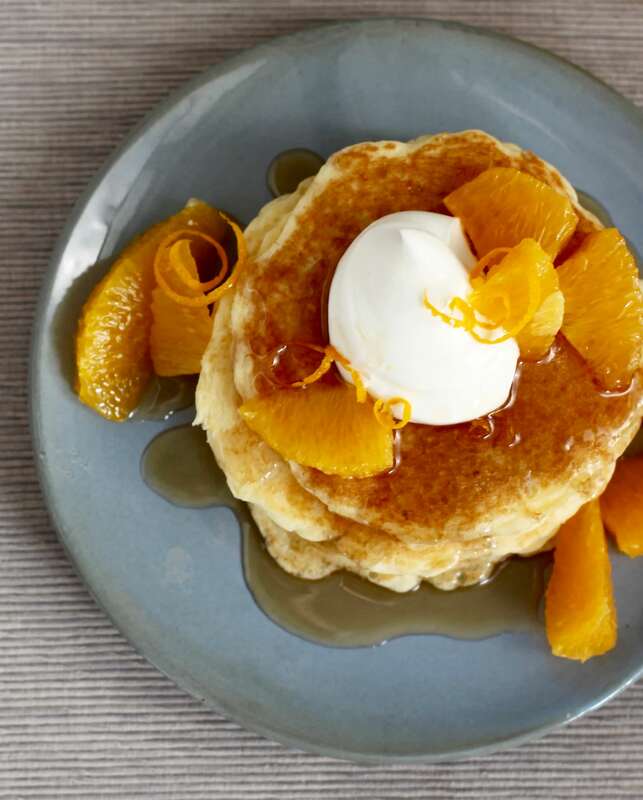 Serve the pancakes warm, topped with a dollop of yogurt, orange segments, and maple syrup.